It is unbelievable but true. The scene we saw at Karupur, near Aduthurai, a year back has transformed completely. Lord Garbapureeswara whose sanctum was the only shrine left behind as the sub shrines of the age old Temple had completely dilapidated. Even the eldest of the village could not say when the ruin had started. They assumed that this was the status for many centuries and nobody came forward to rebuild it. But the place continued to carry the historic name as Karupur in official records. It was known as Garbapuri as it granted the prayer of couples who prayed for a child. The Lord and the Goddess,Garba Prathambikai grant the wish even today. It is amazing to see such a powerful place getting transformation during our lifetime. We saw the Temple for the first time when Ardhra Foundation involved itself in building a shrine for the Goddess at Peravur,located about 2 km from Karupur. The sorry state of the totally crumbled structure of the Sanctum at Karupur had a severe impact on us. We felt that the Temple had to be restored at the earliest . Sharing the news through social media had little impact and it was dissapointing to note people failing to extend even a verbal support. But the Grace of God was the only source of strength to go ahead with the project with the liberal contibution from our Trust members. We knew the limitation of the villagers who relied only on agriculture . Since they could not take over a sizable part of the renovation and consecration, AF took away the pressure from them and completed the project with the set target of conducting the consecration ceremony in the Tamil month of “Thai ” which is the beginning of “Utharayanam ” with the auspicious day in Suklapaksham. It was originally thought to remove the tall trees rooted deep into the vimanam of Swami vimanam. Once the work started,it was realised that the whole structure right from the foundation was too weak as it was made of bricks. Reloading with fresh bricks was just impossible since the foundation could not withstand the load over it. Hence it was decided to take photographs of the old structure and rebuild on the same lines. Granite stones were used for laying the foundation. The entrance to both Swami and Devi Sannadhis were also provided with granite stones. 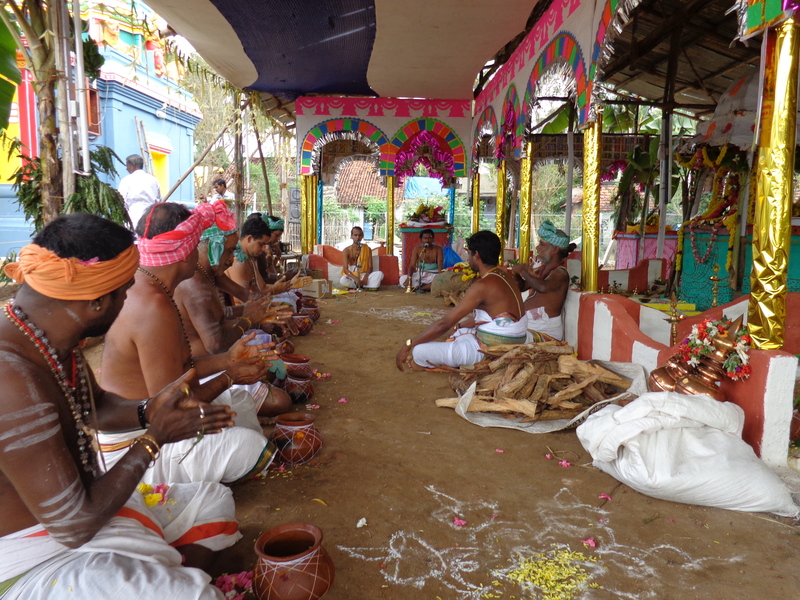 The Prakaram was cleaned well and the new Sannadhis for Ganapathi, Subramanya, Goddess, and Chandikeswara were built. But then the dire need of the hour was a compound wall. Since there were no donors for the ambitious work that could cost very high, we were content to build a fence around the Temple complex. Ardhra Foundation wishes to place on record the timely support extended by well wishers who arranged for Ashtabandhanam, flowers and Homam materials meant for Yagasalai. The holy water was brought from River Veera Chozhan , a tributory of Cauvery that flows nearby. It was kept in front of Sri Athitheswara Swami at Peravur ,2km from Karupur. Then it was brought to Karupur Temple and the priliminary Pujas like Ganapathi Homam,Navagraha Homam,Mruthsangraharanam began simultaneously. 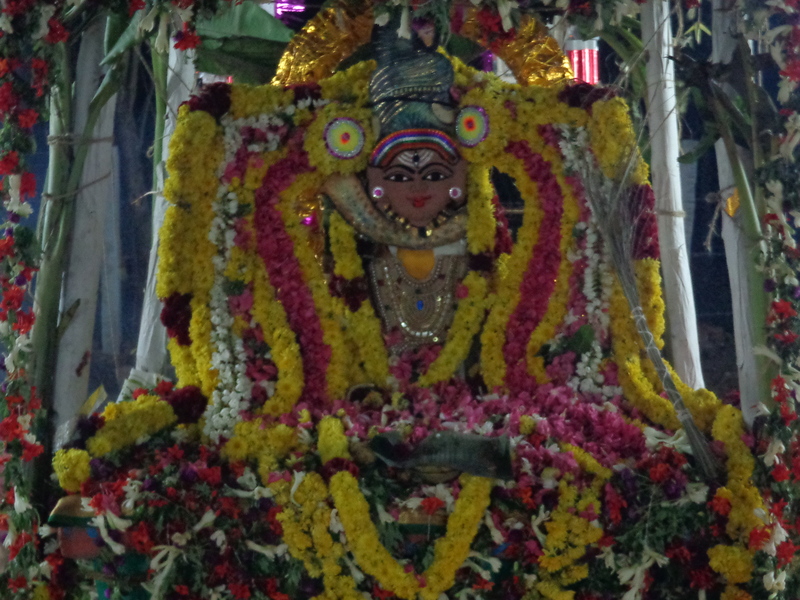 Yagasala Pravesam was followed by Kala Pujas in the evening. Rituals as pescribed by Agamas were carried out for new idols ,by performing Pujas to the Holy Cow, Dhampathis, Veda Vith, Kanya,Brahmachari and Suvasini. People assembled to witness 4th Kala Puja and Poornahuthi on Sunday, 1st February in large numbers. Thiruvavaduthuai Mutt Thambiran Swamigal and Komal Sri Sekar graced the occasion. Gatams were taken in a procession and reached the top of the Vimanams. The crowd was thrilled to see Garuda making circles around the Temple at the Time of Consecration. The Holy water was poured over the Kalasams of all vmanams and sprinkled on the devotees. It was followed by Mahabhishekam at all Sannadhis. Good arrangements were made duing the occasion and AF thanks all those who worked together to receive the blessings of Sri Garbapureeswara Swami and Sri Garbapradhambika Devi. May The Divine couple shower their blessings to all. It was indeed a great satisfaction not only to Ardhra Foundation but to the villagers of Karupur as well.